I have been reeeeeally bad about cooking dinner lately. I get in these all-or-nothing ruts that does not bode well for my family at meal time. A plate full of brownies and a pan full of sweet rolls? Got those. Salad? Got it. A full plate with veggies, starch, and some kinda meat? Yeah… not so much. The problem is really that I don’t care a thing about eating dinner. I love breakfast. Lunch is great! I am totally a soup, salad, sandwich eater. Fruity snacks are fine for my afternoon and I am totally cool with a bowl of popcorn at 5 p.m. Unless we are going out somewhere, I am pretty utilitarian about my own dinner. But I live with dudes. Dudes like dinner. Like they want the whole shebang with a big slab of protein and a pile of vegetables and some bread. And then they want seconds. I kind of dread 5:30 p.m. because it is a rare day that I have my act together when the hungry masses start drifting through the kitchen asking me what’s to eat. The whole process was much easier when my boys were small. Grilled cheese and baby carrots? Yeah! That’s totally a meal! I am always really excited when I find a compromise — these sandwiches are IT. Totally low key, quick, minimal mess, but still meeting all the meaty man requirements this testosterone-filled house deems important (when we move I am totally painting a whole room bubblegum pink, just to prove a point). Also – let’s talk about that CHEESE SAUCE for a second. It is every bit of the best part. 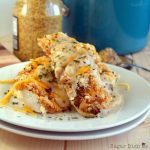 I used Cabot’s Horseradish Cheddar to make it (full disclosure: I love Cabot cheese and I say so pretty often, so they sometimes send me free product to say thanks, but it is a brand I truly use and buy and then add to everything I cook). 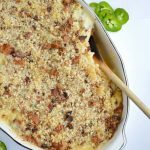 You might remember these same flavors from my Philly Cheesesteak Macaroni. Horseradish and steak are a fabulous pair – if you have ever ordered prime rib at a steakhouse it was most probably served with horsey sauce on the side. If you can’t find Horseradish Cheddar then your favorite sharp white cheddar will do – same crazy melty creamy result. 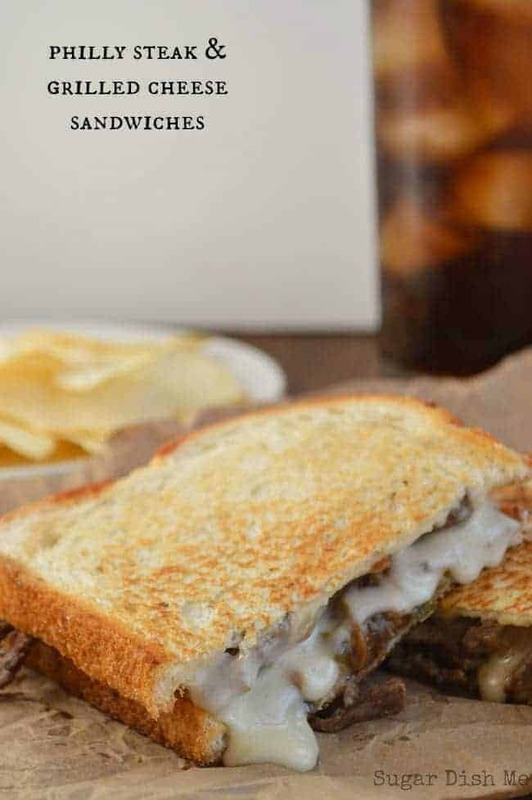 Philly style steak cooked with onions, mushrooms, bell peppers, and garlic smothered in a fantastic and easy horseradish cheese sauce and then grilled on sourdough bread. Slice the steak very very thinly -- I cut mine into 2-3" strips, as thin as my knife would allow. Toss the sliced steak with the Worcestershire sauce. Set aside. Heat the oil in a large skillet. Add the steak, sprinkle it with the salt and pepper, and cook over medium high heat, turning occasionally to brown on all sides, about 8 minutes. While the steak cooks, slice your vegetables. Place the butter for the cheese sauce in a small saucepan and let it melt over medium low heat. Stir the cold milk and cornstarch together and then pour it into the melted butter. Let it heat up slowly. Remove the steak to a plate and add the onions, peppers, and mushrooms to the skillet it was in. Let them cook over medium high heat until they are tender, stirring occasionally, about 6 minutes. When the milk mixture is warm (it will be frothy - careful not to scorch it), remove it from the heat and stir in the cheese until it's smooth. Once the vegetables are cooked, add them to the steak and toss to combine. Melt a little butter (I just rub the stick in the pan) in the same skillet you used for the steak and vegetables. Add one slice of sourdough bread. Top the bread with the steak and veggie mixture. Spoon the cheese sauce over the steak. Top with the second slice of bread. Turn the sandwich to grill the second side and repeat with the other 3 sandwiches. 'Partially frozen' is called for to make the slicing easier. You can place your meat in the freezer 45 minutes to an hour before cutting OR you can take it from the freezer and slice it before it has thawed completely.Once you slice the steak and toss it with the Worcestershire sauce it will thaw completely pretty quickly. Best looking grilled cheese sandwich I’ve ever seen…hands down!! 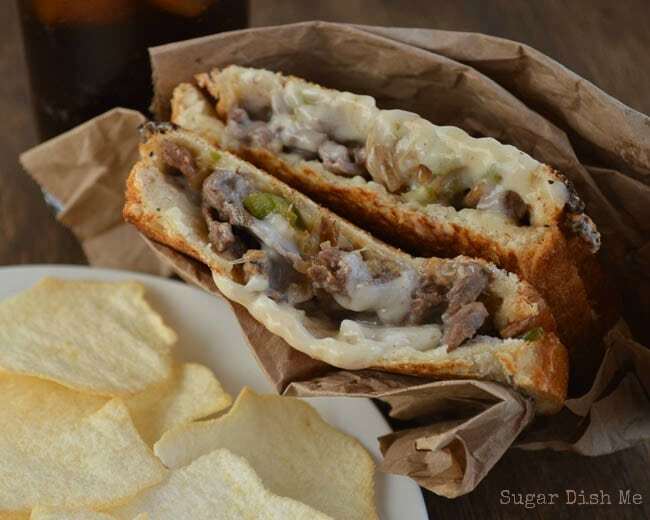 I love a good sandwich and this one just got better with the philly cheesesteak. 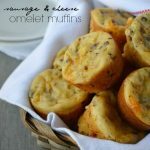 I’m eating breakfast now and already craving this for lunch! I have no words for how amazing this looks. This is the best looking cream cheese, love it! I meant to say grilled cheese! LOL!!!! Haha Angie. Cream cheese, grilled cheese — I’ll take it all. Thank you!!! I know I’ve been living on water and cough drop the past two days, but jeez!! These sammies look AMAZING. Even my dog is licking my laptop screen. Pinned!! haha thank you Meghan!! I hope you are feeling better! Sandwiches are in order. Oh my gosh Heather. That cheese! I need like 10 of these in my life right now! When I worked at a cheese shop, you could not keep me away from the horseradish cheddar. SO AMAZING. 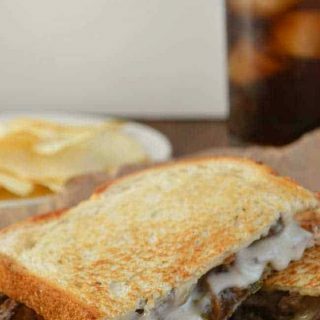 I don’t even like beef all that much but giiiiirl, I’d go to town on these philly grilled cheese sammies. YUMMMMMMMOOOOOOO. I don’t really like beef either but it is sooo perfect with the horseradish cheddar! My first thought was to write a whole post about horseradish cheddar and crackers. Thanks Hayley!! Haha Thanks Julie!! The cheese sauce. Do it. It’s lunch time here and I NEED one of these badly! Looks fantastic!! awww that was so nice! Thanks Kelly! Can Steak-umms be substituted for the flank steak? Hi Rich! Of course! But the cooking method for the steak will differ because Steak-Ums offer package instructions. If you are a Steak-Ums fan or it’s what you have on hand, go for it! please do not put “philly” in this recipe. when u make a grilled cheese sandwich with beef, that is what it is. stop confusing people and also stop ruining a staple with “fusion” New world order bs. Hi. Not sure who made you the “Philly” police, but I’ll call my recipes whatever I like and then you go on and do the same for yours. Okay? Okay. Also — your comment is a special kind of rude. Just thought you should know. I love your response! It was classy and no-nonsense at the same time! 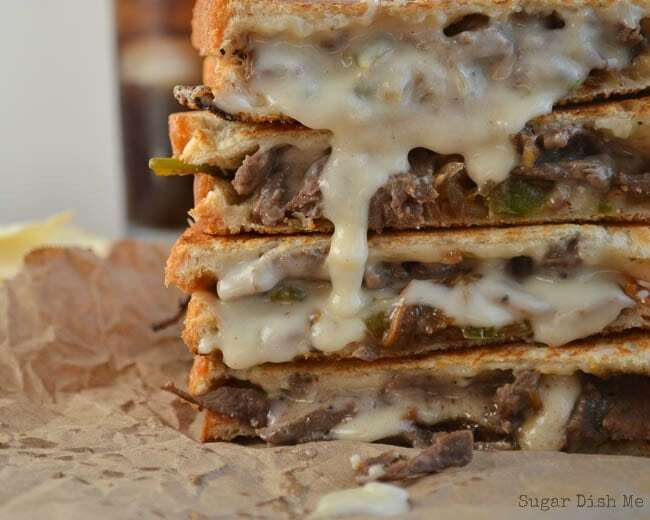 I wouldn’t care if you called it a Philly Steak Grilled Cheese or a Podunk Grilled Cheese. it looks (and sounds) amazing, and that’s all that matters! Is the horseradish cheddar in the cheese section ? I died. This was undeniably the best philly I’ve ever had and the best meal I’ve ever cooked in my life. I am completely devoted to you and your blog! When you say something is good I’ll be nodding my head in allegiance — these were awesome!!!! I keep pestering my dude to come up with something to describe how good they were and all he’s managed to put together was “izzz goood.” I hope my love for you and your amazing recipes has transcended through text ( at least a tad more eloquently than him ;). ) i am also glad you like my comments! I love your blog! Haha. Thank you again Miss Heather for giving the dude and I another good night of full tummies and for helping me with my ‘naive’ questions on how to get the steak! This was my first time ever cooking red meat! If you need me I’ll be creeping on the rest of your posts!! Hahaha Nikole. Thanks so much! 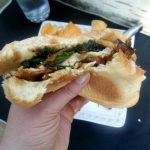 This sandwich has gotten a pretty good bit of pub and I’m glad cause it’s seriously soooo easy and soooo good. I’m thrilled you guys enjoyed it. First time ever cooking red meat? Yeahhhhh for you!